Let it be said, I watched this film with my Jewish beau. He introduced me to it, as his Coming Of Age Jewish Film of choice. Every Jew has one. Ask around, you’ll see I’m right. The gist: Take the plot of every holiday special you’ve ever seen. Now imagine the plot of every hardboiled detective movie you’ve ever seen. Mash them together, and add Adam Goldberg. 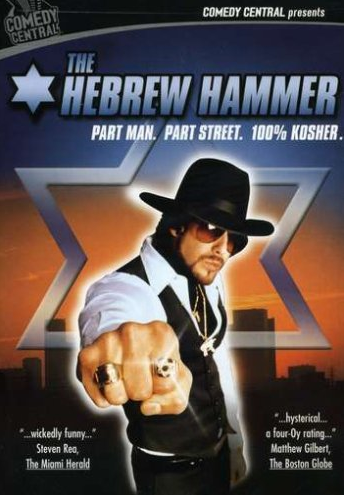 Mordecai Carver is the Hebrew Hammer, a detective who tries to act as a community leader in a world where Jewish people are considered weird. Perhaps in response to being picked on during Christmas time, Mordecai has dedicated his like to being a proud Jew… while looking as fly as possible, of course. Interestingly, this movie directly relates celebrating Christmas to Christians. Which makes it all the funnier when the son of Santa Claus turns out to be EVIL, and bent on destroying all other wintertime holidays except Christmas! So even though the Hammer doesn’t like working for the stuffy elders, someone has to save Hanukkah. Throw in some allies from the (imaginary) Kwanzaa Liberation Front, and you have yourself one of the best movies to watch on Christmas Day when all the presents are unwrapped. Or after the last candle of Hanukkah has been lit, either way. What I “learned”: There’s exploitation films, and then there’s exploitation films. One is gross and not good viewing, and one is downright fun because it points out just how ridiculous classic stereotypes are. And after watching this movie, I’m wondering if we’re finally at a place where we can start playing with the concept without guilt. Maybe we’ve reached the Promised Land. Jewish people are largely a “safe” target in America to make fun of, because they frankly have the same skin tone as WASPS. Same thing with my people, the Irish. But this film also came out nine years before Django Unchained, which makes me think. Django won Academy Awards even though the voters resemble the film’s villains pretty closely in terms of demographic. We all cheering when Django shoots out crackers, no matter what color we are. I pause to hope… could we be entering an age of bada*s, empowered exploitation films? Oh lawd, I can’t even entertain such an awesome thought. See this movie if you like: “Holiday films” with a different feel and bend. This movie’s funny but also downright cynical at times. Plus, you’ll learn something about Hanukkuh! Avoid this movie if: You’re going to enter into the race vs. religion debate with Judaism. Really, people? Really? It’s 2015. I thought we were over this. Short answer: Both. Just don’t assume, and ask your Jewish friend which one’s more important to them personally. Easy as pie. Now go watch this movie already.